There’re phrases that frequently come out of people’s mouth every day and most often, we allow them or they’ve become norm to us and don’t see the abusive side of it. Some people joke with these words day in day out in their relationships. So, is there really anything wrong with using these phrases? I mean, we have all said some of these things ourselves – wink!! or at least had these thoughts about a friend, colleague or even your significant other playfully or not. Phrases like - “What on earth is wrong with you”? “Shut up” “Why are you so ignorant” “You’re so dumb” “Be silent when I speak” “Mumu” etc. To an extent, it depends. Some people easily detect when they’re victims of a verbally abusive relationship. While others may not recognize it till the end of the world. For instance, if you grew up with parents or lived with people who talked to you and each other respectfully and in a polite manner, then you will probably be able to spot verbal abuse from a distance. This is possible because you’ll easily spot the difference in words and tone used. Nevertheless, if you grew up in an environment or family where there was a lot of yelling, fighting, daily argument, screaming, and rain of abuses, then you won’t be able to recognize verbal abuse even when it stirs at you. You’ll must likely take it to be the norm. Except in some rare cases, maybe as a result of a change in environment. You might ask why? It’s because that pattern of communication is normal to you. That’s how you’ve communicated all your life including your relationships. You’re so used to it like you’re having a drink. So it’s all you know and if you don’t include such phrases in a day, it might seem you aren’t okay. Truth be told: just because you’re familiar to such words or phrases, doesn’t make it right. Verbal abuse is not justified in any situation or environment. It is what it is!! What is a verbal abuse? Verbal abuse can basically be described as any communication event that causes emotional damage to at least one person. It is used to hurt. Verbal abuse is to treat with cruelty. Verbal abuse is also an unjust, corrupt or wrongful practice or custom. One of the negative effects of continuous exposure to this trend is serious damage to the victim’s self-esteem and self-worth. Sometimes, verbal abusers don’t come out plain so you’re lost right in the middle of the abuse. They’re found of making subtle negative comments here and there and giggle so you don’t suspect a thing. Note: The utmost goal of verbal abusers is meant to manipulate and control their victim, not minding it’s their significant other. This is one of the more subtle tactics used by verbal abusers. It’s meant to bamboozle their victim. For example, a man might say to his significant other “you look like bread in water” and say it with a smile on his face and a charming tone and probably giggle. What he’s really saying is that she’s fat. It’s a disapproval disguised as a joke or teasing. Verbal abusers latterly don’t take your feelings into account because they don’t find them important. They see your emotions as secondary or nothing of interest. For instance, you complain to them about someone who’s mean to you and all they could reply with is “get over it” or “what do you want me to do”. Verbal abusers are rude and could also lack empathy. With reference to #2 above, when your significant other use words or phrases that dehumanizes, they are verbal abusers. They use humiliating or degrading words you think or feel that you are a second class human. They deliberately make you feel so low or lower than low pointing to the fact that they are far better than you could ever imagine. So If you hear your significant other say things like, “No one would ever put up with your **** but me” etc. That’s degrading and cruel. Verbal abusers are very good at accusing others. Perhaps they’re habitually suspecting you of cheating on them or you once told a lie and they keep calling you a liar or don’t just believe whatever you say anymore etc. They always have fun accusing other people. For instance, you want to talk about how to improve your relationship or point out some things you’re not comfortable with, a non-verbal abuser will sit and hear you out and then respond appropriately. But a verbal abuser will do all they can to change the topic of discussion directly or not. Sometimes, they make light of what you said and start a conversation that they want to talk about and not yours. In other words, verbal abusers avoid giving you the power to talk about what you want. Judging and criticizing is one of the tactics employed by verbal abusers so they’ll always be in-charge. A verbal abuser will always say what you say or do is wrong. For example, maybe you prepared a nice meal and you’re so proud of yourself. An abuser would come home and find something wrong with the meal. Or criticize how you look while having an interior motive. Verbal abuser will employ this method to bring your self-esteem to zero level so they can control or manipulate you. Abusers don’t take responsibility for anything. They’re found of placing blames on other people order than themselves. 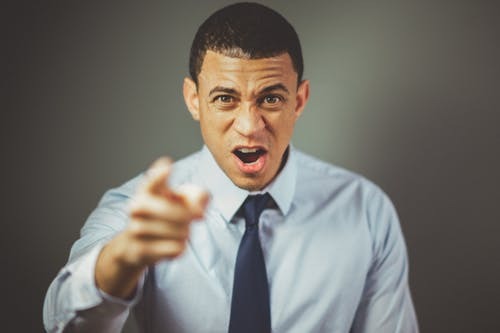 With reference to #7, if someone is constantly using swear words with you, especially when combined with anger, then that is verbal abuse and it is manipulative. With reference to #7 and 8, threats can come in all forms. There’re basically two forms threat can appear- It could be a threat to harm you – or it could be a threat that they might harm themselves. All of this is to scare and manipulate you in the relationship into behaving just the way they want you to. There’s no two way about this: “name-calling is bad”. If your significant other calls you bad names such as “lazy,” “careless,” etc, that’s not okay. Name-calling is also used to demoralize someone. Make them feel lesser than you. Like they can’t think without you. Abusers crave for total control. They want their voice to be the only one heard. Hence, they’re generally bossy and order their victims around like errand boys. If your significant other negatively acts more like a parent to you, then it’s verbal abuse. One of such ways includes: Limiting how often you leave the house, how many showers you can take per day/week etc. Everyone has flaws and has made mistakes sometime, but no one needs them pointed out on a daily basis.. Therefore, if someone is constantly pointing out what is wrong with you, or what mistakes you have made in your life, then that is verbal abuse. With reference to #11, you know how it feels when you share a great idea with your boss and he shoots it down? Well, that’s exactly what verbal abusers do. When you share an idea or an opinion, a verbal abuser will just shoot it down and disregard it. Naturally, you’ll want your abuser to calm down and reason with you. Regrettably, this rarely works. Let’s say 1 out of 20 abusers will reason with you that moment. Eventually, you’ll have to stop them by being firm and not trying to reason with them. Let’s call a spade a spade – they’re abusers. If you can leave that scenario, please do. You could go into your bedroom if you have one. Go for a drive or take a walk if you can. Ensure to leave that scenario and tell them that you won’t talk to them until they can talk with some respect and calmness. Note that this might trigger more abuses or anger from the abuser. So be prepared. Get a clear mind!! They suddenly realize you’re on to them and recognize their manipulative tactics when you call them out on their bad behavior and this takes away their power. Just like bullies, abusers love easy targets. Hence, if you do nothing about their behavior, it’ll sure continue. But if you tell an abuser to stop their abusive behavior, they won’t like it and will either have to try to change their behavior or go find someone else that they can verbally abuse because they now know you will no longer allow them to keep abusing you. With reference with #2, when you’ve called them out on their abusive behavior and are will to change, you can seek for help from professionals. It all depends though, this could be difficult for some but if all else fails, you might have to do this or stay and don’t complain of their behavior any longer. I recognize the fact that it’s not possible with some relationships like parent/child. But it’s possible with some. Sometimes that’s the only thing left to do. Remember that, what we allow from other people will continue. It all starts with self-love. You have to love and respect yourself so not to give room to abusers in your life.